Finding 'Common Good' Among Evangelicals In The Political Season A Minneapolis pastor is traveling the country, speaking to conservative Christians about faith and the Republican Party under Donald Trump. The conversations are dominated by concerns about abortion. Doug Pagitt, a pastor from Minneapolis, and his crew hold a meeting aimed at evangelical Christians, in a church in San Antonio. They are touring the country to talk to evangelicals about the midterm elections. 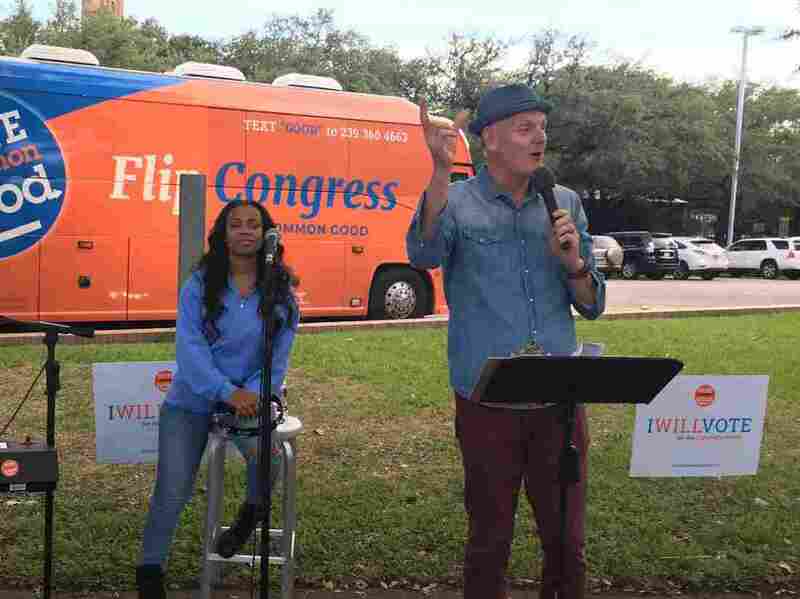 On a recent evening in Houston, under the heavy branches of live oak trees, Doug Pagitt stood before a couple dozen people gathered on blue folding chairs on the Rice University campus. "You've heard it said that to be a true Christian, you must vote like a Republican," he said. "But we are here to be reminded that just ain't so." You have heard it said, 'America First,' but we are here to be reminded to 'seek first the Kingdom of God,' on behalf of all those everywhere in the world. Pagitt, 52, describes himself as a progressive evangelical. He pastors a church in Minneapolis and has been traveling the country by bus, preaching a message that juxtaposes Trump campaign slogans against quotes from the Bible. "You have heard it said, 'America First,' but we are here to be reminded to 'seek first the Kingdom of God,' on behalf of all those everywhere in the world," he said, quoting the words of Jesus in the Gospel of Matthew. Pagitt's organization, Vote Common Good, is focusing on evangelicals and other Christian voters who feel out of place in President Trump's Republican Party. It's an uphill battle, given that more than 8 in 10 white evangelical voters supported Trump in 2016. Pagitt said the group has just under $1 million in private donations. They're touring the country ahead of the midterms, visiting more than 30 congressional districts that were chosen in part based on their religious makeup. At an event in San Antonio, Tracy Goodrich, 48, said she and her husband quietly left their evangelical church soon after the election. 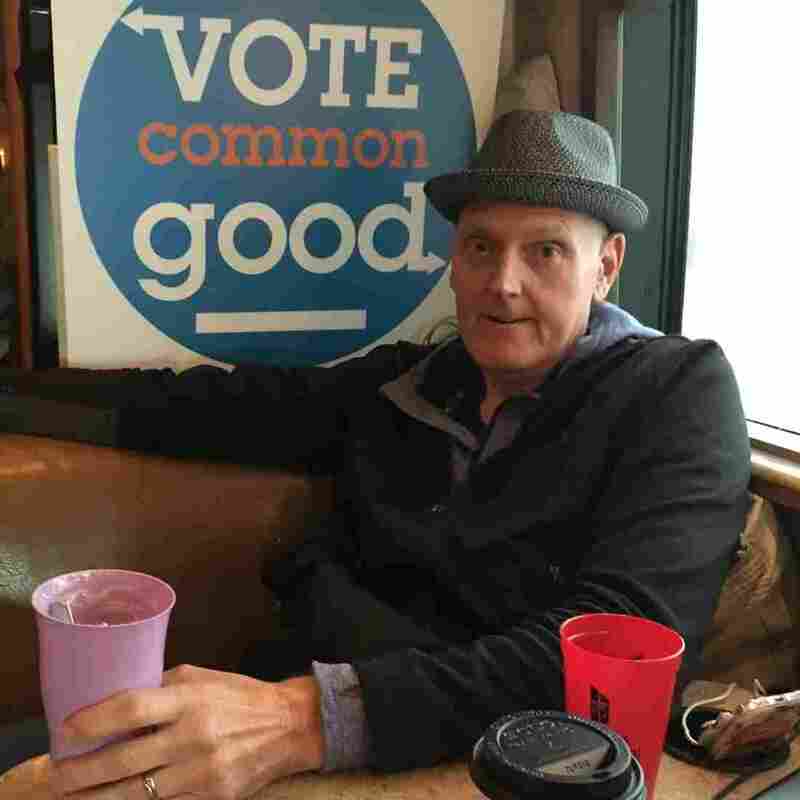 Pastor Doug Pagitt's organization, Vote Common Good, is focusing on evangelicals and other Christian voters who feel out of place in President Trump's Republican Party. "I kind of feel like I'm in this space where I grew up in an evangelical home, and with the last several years just kind of not feeling like I have a home as the things I once felt represented Christ and Christlikeness — completely the opposite things I see have been supported by family and friends and community," Goodrich said. Goodrich, who is still home schooling two of her four children, said she voted for Republicans until 2016. But she doesn't like the way Trump talks about vulnerable people, she said, like immigrants, women and the poor. Goodrich said many of her evangelical friends initially opposed Trump until it became clear he would be the Republican nominee. "Literally all of a sudden, Donald Trump — we couldn't see anything wrong with Donald Trump. It was: Now we're blind to everything. But it was all on the abortion issue," she said. Goodrich describes herself as "pro-life," but she said other issues, like helping the poor and helping those facing discrimination, should be just as important to Christians. Singer Meah Pace has been traveling with the group, performing hymns like "Amazing Grace" at parks and churches. Pace grew up in a predominantly black Baptist church. Unlike their white evangelical counterparts, black Christians overwhelmingly vote for Democrats; Pace said people who've faced a history of disenfranchisement often see the abortion debate differently. "When you are fighting to keep your family together; when you're fighting to keep your children safe — from criminals and from cops; when you don't know if someone's gonna pick up your résumé because of your name; when you don't know how you're gonna send your kids to college — things like that, because things were set up that way to disenfranchise people," Pace said, "us fighting about an issue like this is something that we feel we can leave in God's hands." Doug Pagitt said the issue of abortion has come up again and again since the bus began touring in early October. He published an op-ed in USA Today this week, arguing that evangelicals should put more energy into reducing abortions than trying to criminalize them and should vote against politicians who support Trump's agenda. Singer Meah Pace (left) has been traveling with the Pagitt's group, performing hymns like "Amazing Grace" at parks and churches. Kristan Hawkins, who runs the anti-abortion-rights group Students for Life, is a former evangelical who converted to Catholicism. She said she has heard this argument before and doesn't think most conservative Christian voters will buy it because of how they view abortion. "There are certainly a lot of issues that Christians care about when they go to vote," Hawkins said. "But at the end of the day, we know there is a human rights atrocity happening inside of our country — and that atrocity is abortion." However the issues are framed, pollster Robert Jones of the Public Religion Research Institute said moving white evangelicals away from the GOP will be an uphill battle. "Once you have several generations that are voting 80 percent Republican, it's less that they're doing that because of one particular issue, and more that it has become, in many ways, a kind of tribal identity that's just inextricably tied to evangelical identity," Jones said. "And I think that is the tie that binds much more than any single issue." 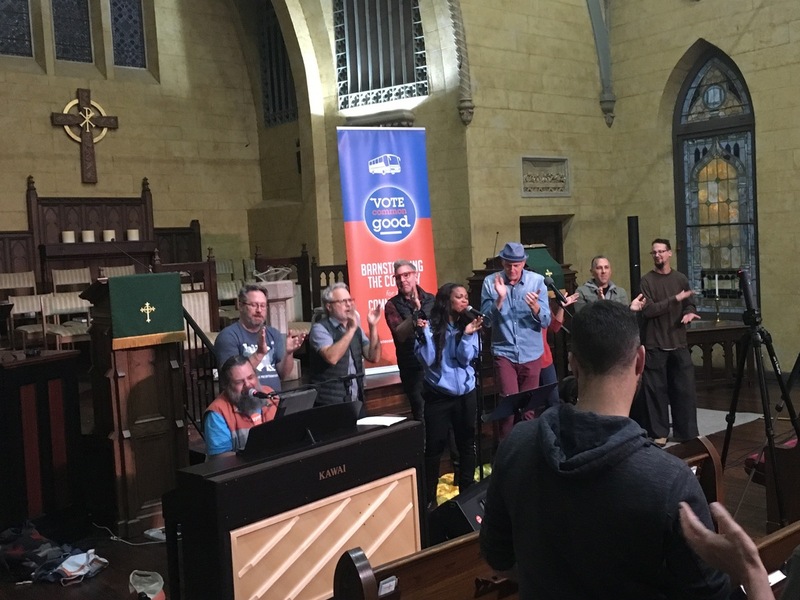 Vote Common Good is trying to push beyond those identities by talking to small groups of Christian voters almost daily in the weeks leading up to the midterms. Organizers say they're planning more events for the 2020 presidential cycle. Rep. Ted Lieu, the current vice chairman of the Democratic Congressional Campaign Committee, has informally advised the group. He said he hopes they will "help Americans understand that if they want to vote their conscience, there is a place in the Democratic Party for them." Lieu said Democrats could do a better job of reaching religious voters including Christians. "Religion and faith is something that's been part of America for over two centuries," Lieu said. "For one party to ignore that aspect of American life is not a good idea."